Just like with IoT, the term smart building has a pretty broad definition. For instance, RCRWireless’s technical definition claims it refers to ‘any structure that uses automated processes to automatically control the building’s operations, including heating, ventilation, air conditioning, lighting, security and other systems.’. Financial – What is the cost of running the building as a functional and productive entity, literally what is the cost of keeping the lights on? Ethical – How corporately and environmentally responsible is the building and the occupants within, in relation to similar structures? So why are we so interested in a footprint? Well, it provides us with vital data, which leads not only to awareness but predictability – something all companies crave! Nope, sorry Jim and Bob, don’t think that strategy is going to cut it. 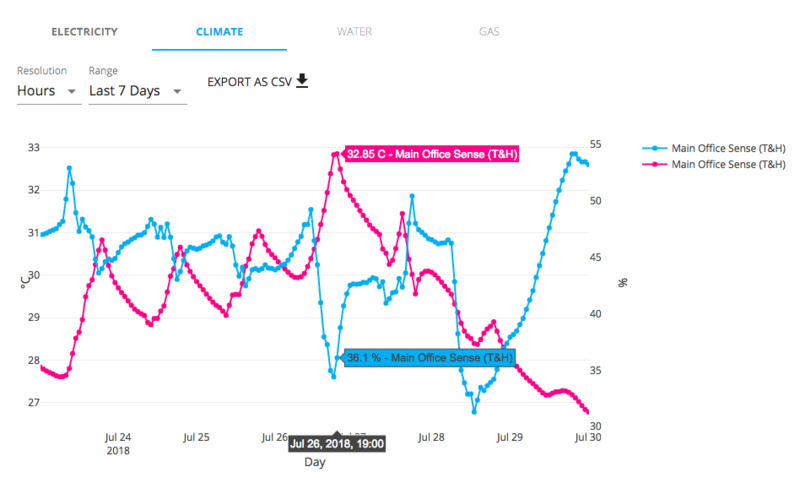 Through analytics, IoT sensors, and big data Jim and Bob were able to pinpoint a specific time period and location where the electricity usage spiked , and take care of it with a (not so healthy) alternative solution. These type of implementations are called “Measurement and Verification”, or M&V systems. M&V systems not only give new insights into the living building vitals and its footprint, but also assist in making decisions to drive efficiencies and verifying bills from suppliers. Now, if the electricity supplier claims that one million kilowatt-hours of electricity was used last quarter, building managers can rest assured that the figure is actually true. It’s worth noting that, the biggest challenge for a M&V system is the retrofit. The best time to install an M&V system is at the time the building is built. Traditional M&V systems have a deep integration into the physical structure of the building – it takes many sensors on pipes, power boards, and extensive wiring. Retrofits therefore take a lot of work, which of course comes at great cost. Being very aware of the complexities and install time of traditional systems, we believe M&V IoT solutions for buildings should be slick, easy to install, and scalable, with seamless IoT functionality. So, after extensive research we are now proud to have partnered up with Buddy – a Australian founded company with a global reach. The core focus of Buddy is ease of implementation. Sensors for building vitals such as temperature, humidity, electricity, or water usage are deployed around the building. For temperature and humidity, they may be on a room by room basis. For the electricity and water, it could be by room, or perhaps by facility or function (e.g. lighting or heating). After the sensors are deployed, they need to communicate their readings. Since there could be tens or hundreds of sensors in a building, some form of aggregation of data has to occur. This is a cleaner and more cost effective solution than having each sensor communicate directly to the cloud. So at certain points, gateways are installed. The gateways aggregate the sensor data and pass it to the buddy cloud for processing. The gateways can connect via WiFi or ethernet, but the most common method is to connect via cellular. 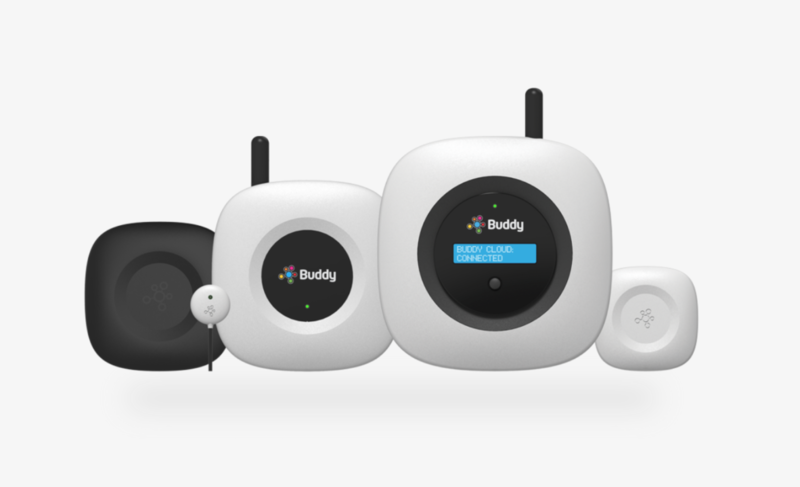 The buddy gateway has inbuilt cellular connectivity, which allows it to be totally independent of any underlying network. You can learn more about why cellular can win over wi-fi here. Another of of Buddy’s core philosophies is to make data look good. The guys place a large emphasis on a slick interface with visual impact. They also believe it’s important to show the pulse of the building, exactly like holding a stethoscope to the walls. To do this, the Buddy system visualises and displays data via a Buddy display module, which outputs to a TV or display panel via a HDMI connection. Instead of showing a series of world clocks, or a loop of the news on mute, why not show the pulse and vitals of the building? Here are some examples of Buddy dashboard in the Pangea office. Yes, it did get that hot in the Pangea office during the heatwave (pink line). That should do it for an intro to the Buddy platform. In the next blog post we’ll be getting in depth with some more deployments and features. In the meantime, you can learn more about Buddy here. If you want to know about Buddy or have any other questions, feel free to get in touch with us at contact@pangea-group.net.